The much anticipated Frida Kahlo and Diego Rivera: from the Jacques and Natasha Gelman Collection exhibition is days away from opening at the Art Gallery of NSW! Right in time for the school holidays with some Frida inspired school holiday workshops for the kids. More than 30 artworks and 49 photographs from the Jacques and Natasha Gelman Collection will be displayed at the Art Gallery of NSW from Saturday 25th June to Sunday 9th October 2016. These iconic works and photographs tell the story of two of the world’s most famous 20th century artists Frida Kahlo and Diego Rivera from 1911 through to the 1950s. Frida Kahlo and Diego Rivera: from the Jacques and Natasha Gelman Collection includes some of Frida Kahlo’s most iconic works, including Diego on my mind (pictured above) and Self-portrait with monkeys (both 1943), as well as major examples of Diego Rivera’s canvas paintings. “Natasha and Jacques Gelman enthusiastically acquired and commissioned works by Frida Kahlo and her husband, Diego Rivera, when there were only a handful of collectors in Mexico. Their passion for Mexican art continues through the Vergel Foundation which actively collects contemporary Mexican art and supports Mexican artists” said Robert Littman, President of the Vergel Foundation. Director of the Art Gallery of NSW Michael Brand said this compelling staging of Kahlo and Rivera’s paintings is unique as it is supported by an archive of photographs that have not been seen in Australia previously. “Frida Kahlo and Diego Rivera: from the Jacques and Natasha Gelman Collection speaks to the artistic dialogue between Kahlo and Rivera while emphasising their fierce independence and the uniqueness of their artistic visions." “Frida Kahlo and Diego Rivera’s private lives were inextricably linked to their work, all meticulously chronicled in their paintings and also highlighted in the photographs in this exhibition,” Brand said. The 49 photographs of Kahlo and Rivera are taken by the renowned photographers Edward Weston, Nikolas Muray, Hector Garcia Cobo, and Guillermo Kahlo – Frida Kahlo’s father. "Frida is the only example in the history of art of an artist who tore open her chest and heart to reveal the biological truth of her feelings." Diego Rivera. Frida Kahlo was born in 1907 in Mexico City. Her father was a German-Jewish immigrant and her mother was a Mexican of mixed Spanish and Indian descent. Diego Rivera was the son of a teacher and was born in 1886 in Guanajuato. Kahlo and Rivera married in August 1929, a union that Kahlo's parents described as a "marriage between an elephant and a dove." For a quarter of a century Frida Kahlo and Diego Rivera were passionate companions. Kahlo’s art was small scale and took a mostly autobiographical focus, while Rivera tackled large scale public murals with strong political convictions. This contrast is visible even in their portrayals of each other: Rivera painted Kahlo as a cultural symbol and she painted him as her beloved husband. There was also great difference in the couple’s artistic backgrounds. Rivera had undertaken academic training in Mexico and Spain and had spent an extended period in Paris, where he was an active participant in modernist movements. While Kahlo was essentially self-taught, with her artistic endeavours first inspired by the need for distraction during her lengthy convalescence from a streetcar accident as a teenager. 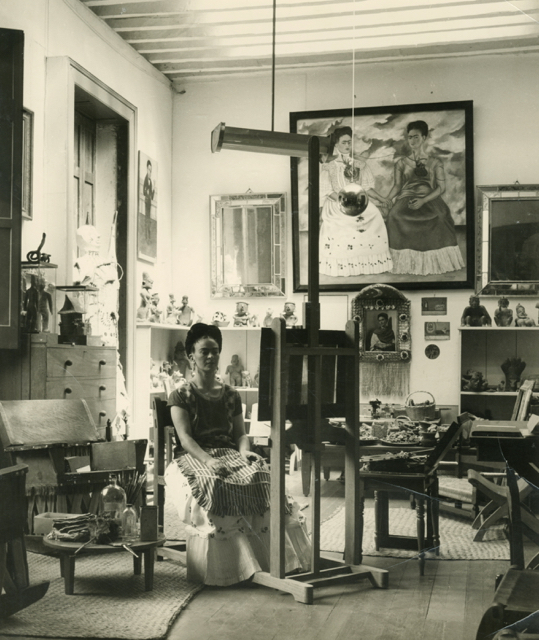 Rivera and Kahlo's relationship was often troubled, but their support of each other’s art endured. Rivera who was much lauded during his lifetime, named Frida as his best critic. Their relationship remained a source of inspiration for Kahlo’s work, which unlike Rivera’s, was not widely celebrated until after her death. Frida Kahlo and Diego Rivera: from the Jacques and Natasha Gelman Collection will be on display at the Art Gallery of NSW from Saturday 25th June to Sunday 9th October 2016. Tickets are on sale now via the Art Gallery of NSW website. Frida Kahlo inspired school holiday activities will be taking place at the Art Gallery of NSW. There will be a Free artmaking activity for families, a Family workshop: Mexican fiesta and a Family workshop: Bags of colour. Fees applies for workshops, checkout the Art Gallery of NSW's kids website for more info.